The Lawn Bowls Group meets in the Clubhouse at the Lawn Bowls site. The once a Month Bunco during the winter Months is in the Annex. ​​On Saturday 7 April 2018, the Friendly Valley Lawn Bows Club will host our annual bowling tournament. Participants will primarily include teams from the Southwest Division, although any members of the national Bowls USA association would be welcome to participate. 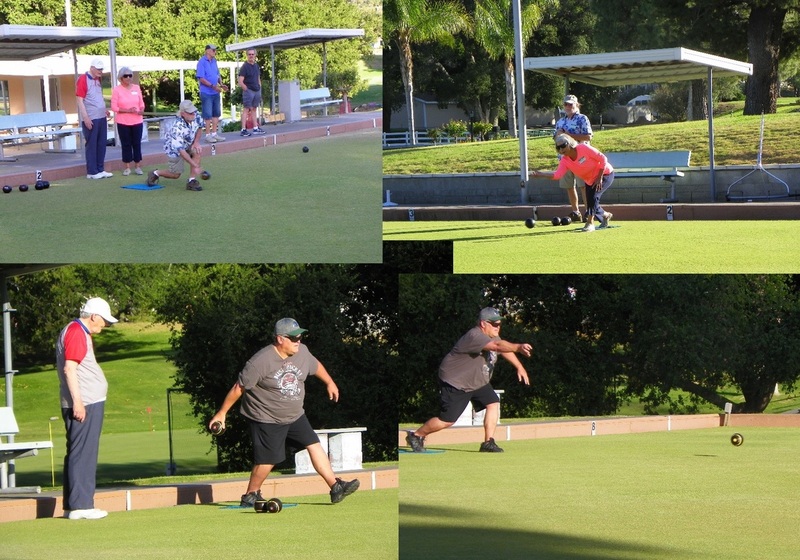 We would hope that residents of Friendly Valley would drop by to watch this sociable, but competitive game of lawn bowling, and to cheer for any of our team members who are playing. Details of the tournament are presented in the flyer posted below. ​The Friendly Valley Lawn Bowls Club will sponsor a New Years Eve party as shown in the flyer posted below. Those who missed our Halloween - Casino Night fun-filled party will now have another chance to join in on the fun. We would be happy to see you there. The Friendly Valley Lawn Bowls Club (FVLBC) sponsored a Halloween party and Casino Night in late October. (See flyer previously posted below.) Those who attended the event had a great time. Several photos taken by FVLBC member George Patton and FVLBC president Judy Brothers are posted below. If you missed this fun-filled event, you will still have a chance to attend the FVLBC New Years Eve party. Information concerning that upcoming event will be posted soon. Jack this is where your text will go. the box above will allow you to resize, change color bold etc. The FVLBC Casino Night Experienced a Great Turnout! 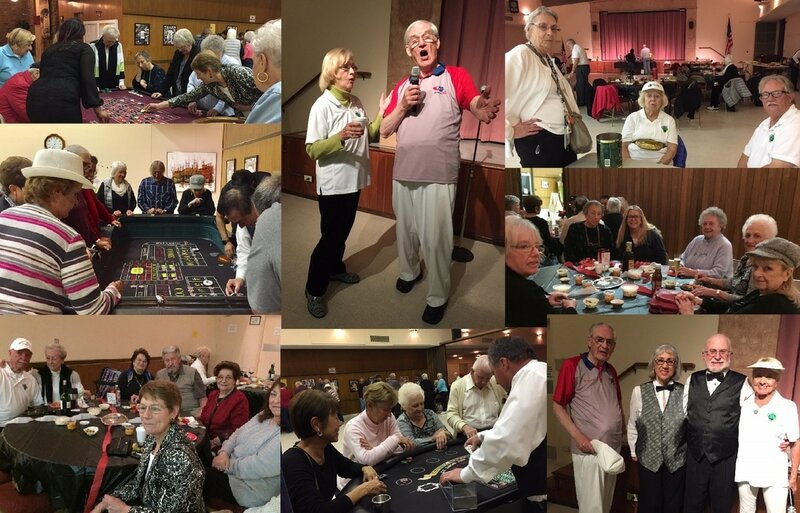 We were pleasantly surprised at the turnout to our 50th Anniversary Casino Night. All who have spoken publicly have emphasized how enjoyable the evening was. There were several positive comments by attendees regarding the dealers. Several photos of the event were taken by FVLBC President, Judy Brothers, and most of them are posted below in the two collages. The weather cooperated and our in-house tournament went off as scheduled on 21 January. 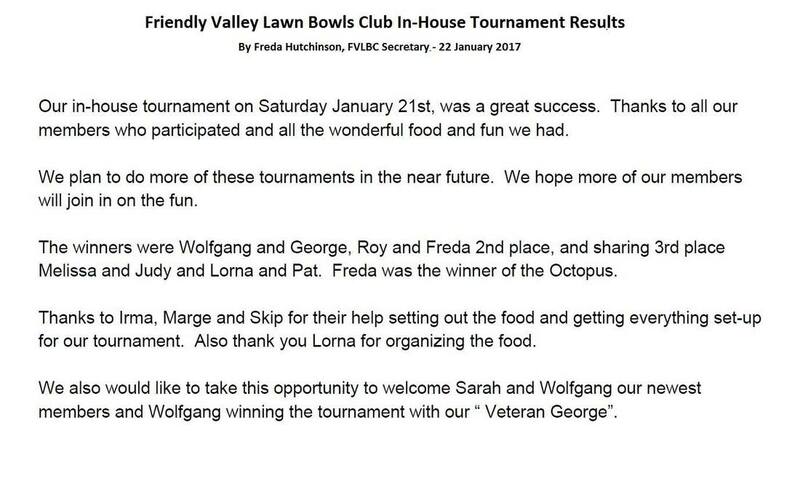 It was quite a lot of fun, as described by our club secretary, Freda Hutchinson, in the first posting below. Photos were taken by new members Sarah & Wolfgang Henning and by club president, Judy Brothers. Several of these photos are also posted below. In the first (group) photo, the participants and helpers (l-r) are: Sarah Henning, Wolfgang Henning, Irma Patton, George Patton, Freda Hutchinson, Judy Brothers, Melisse Benson, Lorna Bausch, Roy Rogers, & Roy McAree; not shown are helpers Marge Edwards & Skip Stanfield. The Friendly Valley retirement community has had a memorial day parade for several years. It was formerly sponsored by the FV Veterans Club, but now has a different committee of volunteers. The Veterans Club still conducts the closing ceremony after the parade, which is a memorial service for departed veterans of FV. A roll call of the dead is called, and the list continues to grow. Various clubs from Friendly Valley, and individuals, participate in the parade. A local high school marching band always participates, as does a local classic auto club and numerous other groups. 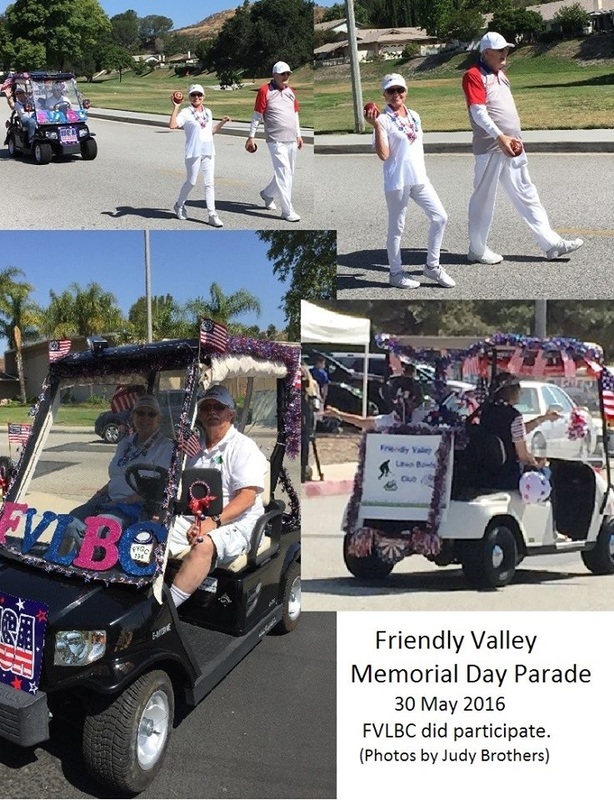 Our lawn bowl club members were quite active in the parade this year, as may be seen in the attached collage. 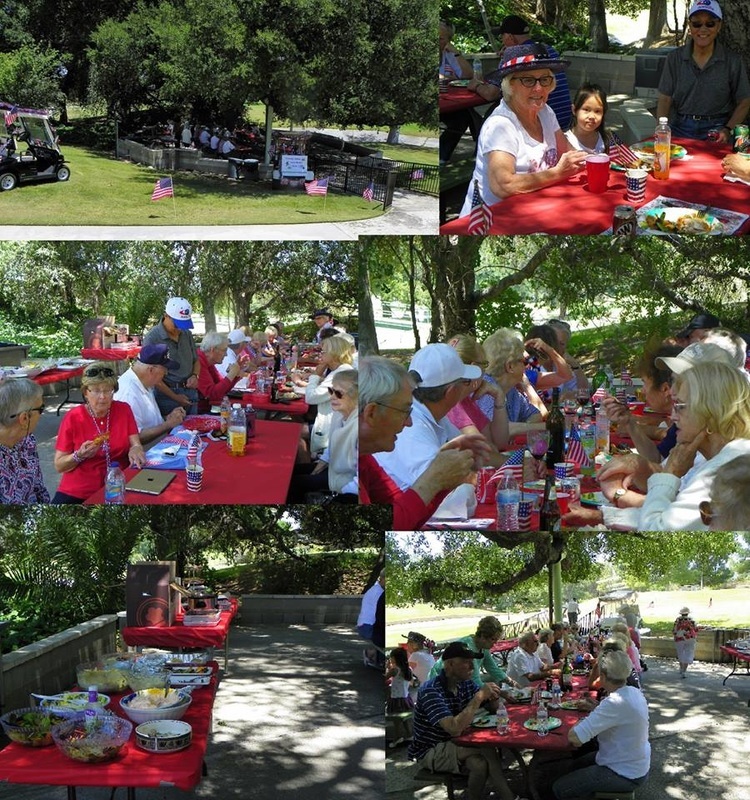 It has been the custom of our club to have a spring picnic on Memorial Day, following the parade and Veteran’s service. The club provides fried chicken, but otherwise, it is a pot-luck affair. There were many delicious salads and other side dishes. It was nice under the shade of the large oak tree; but too hot on the green to bowl later. A few snapshots of the party are shown in the attached collage. The Friendly Valley Lawn Bowls Club invites you to participate in FREE LAWN BOWLING LESSONS to be held EVERY MONDAY & FRIDAY EVENING starting at 6:15 PM. The lessons will be conducted by BowlsUSA Club Coach, Roy McAree. Each lesson will last about one hour. Bowls and other equipment will be provided by the club. If you plan to participate, please wear flat-soled shoes (tennis shoes). Lawn bowling is a mildly physical sport, which is competitive, but very social. The game has roots in ancient Rome, and was a favorite pastime of many famous people, including Sir Walter Raleigh and Walt Disney. A photo of BowlsUSA Coach RoyMcAree conducting lessons is shown in the attached photo collage. Your Lawn Bowling Club has purchased 2 Bowling Arms. Bowling Arms have become a popular aid for those who wish to continue to play the game and for those who would like to start, but have difficulty because of ailments such as: painful ankles, knees and hips, old sporting injuries, neck and/or spinal inflexibility, arthritis and various surgeries. The Bowling Arm has come to the rescue. The Friendly Valley Lawn Bowls Club has purchased two bowling arms produced by Drake’s Pride. These arms have become a popular aid for those individuals who would either like to continue bowling, or start bowling, but who have difficulty because of ailments, such as painful ankles, knees, and hips; and neck and spinal inflexibility. Many of these conditions may have been caused by arthritis, former surgeries, and/and prior sporting injuries. Shown following are two collages. The first one shows BowlsUSA Coach Roy McAree demonstrating the use of the device. It may be seen in the upper left quadrant that the jaws of the device are open in the relaxed state. By squeezing the two handles together, the jaws close to grasp the bowl. It is relatively simple to manipulate in that respect. After gripping a bowl with the jaws and checking the bowl orientation, one makes a few swings back and forth, and then releases the bowl by relaxing their grip on the upper handle. 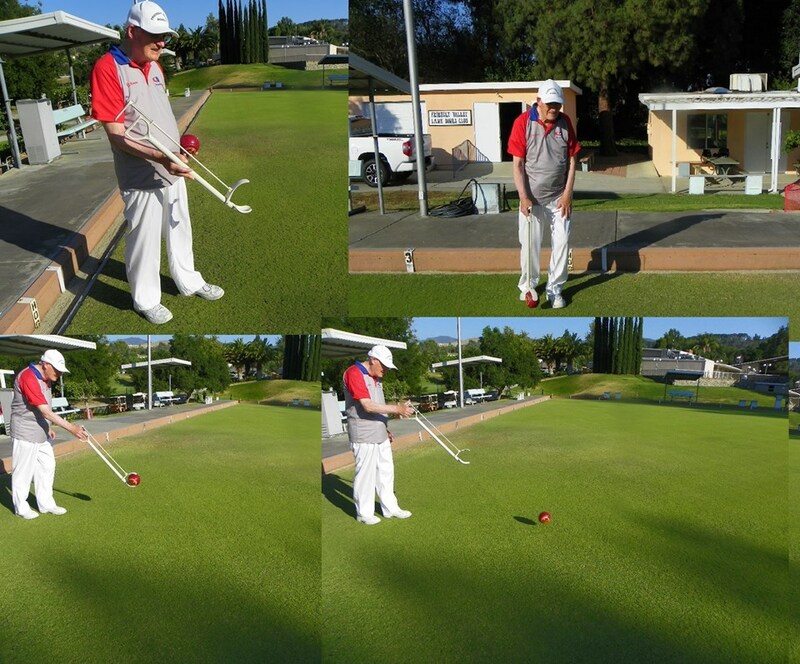 The second attached collage shows Coach Roy leading an introductory practice session with the bowling arm device for other members of our club. The trick is to do the release smoothly, along the shot line, without lobbing the bowl. It will take some practice. Most of the few of us who were willing to try it in front of the crowd of about twenty spectators, were at least successful in rolling the bowl several meters, but not necessarily along the intended line. One bowler (not me) did exceptionally well on his second attempt, and rolled it a great distance along the intended line.